Video clip synopsis – Is the rate of present day consumption enslaving future generations? Broadband MP4 globwarm_bb.mp4 (9.6MB), suitable for iPods and computer downloads. The different aspects of the environment that will be affected by climate change. How different parts of the community could act to reduce the impact of climate change. 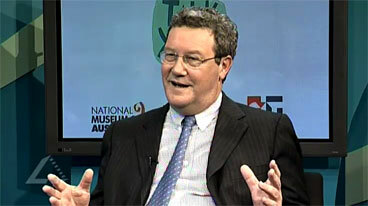 Take notes on the main points that Alexander Downer raises. In this clip Alex Meekin suggests there is a parallel between climate change and slavery and the behaviour of governments in both cases. How do you respond to this notion? Write about 100 words that persuasively argues your viewpoint. Construct a poster that promotes five positive steps the Australian government could do to help stop climate change. Your poster could be serious or satirical.